A federal indictment of Winterkorn, who has maintained his innocence throughout, was unsealed in U.S. District Court in Detroit on Thursday. FRANKFURT -- Once revered in Germany for building Volkswagen Group into the world’s biggest automaker, former CEO Martin Winterkorn is now facing a growing backlash in his home country, with calls for him to be held accountable for the diesel cheating scandal following his U.S. indictment. Politicians from Chancellor Angela Merkel’s governing coalition, as well as opposition lawmakers, weighed in over the weekend, saying Winterkorn should face punitive actions in Germany for creating a culture at the automaker that allowed such a scandal to take place. "I cannot imagine that the accusations would only lead to an indictment in the U.S. but not in Germany,” Georg Nuesslein, a lawmaker from Merkel’s Christian Democratic-led bloc, told Frankfurter Allgemeine Zeitung. He said he found it puzzling that an executive can steer "such a global company and still claim he didn’t know about all of this." A federal indictment of Winterkorn, who has maintained his innocence throughout, was unsealed in U.S. District Court in Detroit on Thursday. It accused him of conspiring to defraud the U.S. and violate the country’s clean air laws. He’s also under investigation in Germany and a spokesman for prosecutors looking into his conduct told the Frankfurter Allgemeine Zeitung newspaper that the probe is likely to wrap up this summer, adding that he wasn’t surprised by the U.S. actions because his office has the same information. Winterkorn, once Germany’s top paid manager, is also facing possible action by his former employer. VW said on Saturday that it was looking into pursuing possible clawbacks from current and former executives, reiterating comments made at the automaker’s annual meeting on Thursday. 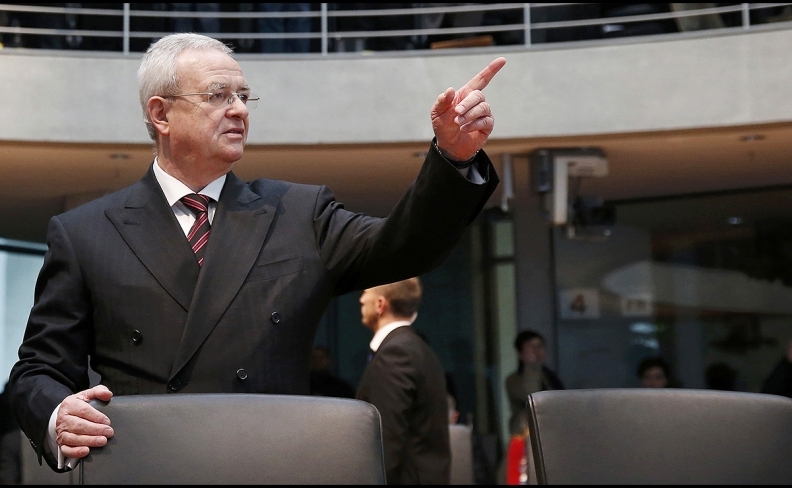 Winterkorn has repeatedly claimed he wasn’t aware of the diesel cheating software that engulfed the company, most notably when he stepped down in 2015 and again last year at a hearing with German lawmakers. "Nobody believed him at the time but we couldn’t prove him wrong," Kirsten Luehmann -- a lawmaker from Merkel’s junior coalition partner, the Social Democrats -- told Deutschlandfunk radio on Saturday. Luehmann, who sat on the committee that investigated the diesel emissions cheating, said she trusts that German prosecutors will indict Winterkorn, if warranted, once their investigation is complete. Opposition lawmakers have also been critical of the government’s handling of the diesel scandal, arguing that the relationship between automakers and the ruling coalition has been too cozy. Cem Oezdemir, a Green Party lawmaker, told broadcaster ARD on Saturday he endorsed the move by U.S. authorities to indict the former CEO and said German politicians for too long cultivated an "unholy alliance" with top managers in the country.